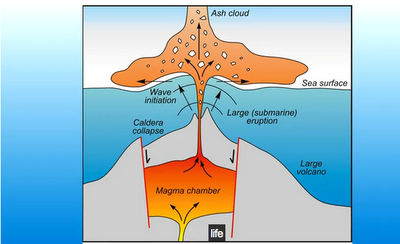 Mississippi Canyon Block 252 in the Gulf of Mexico is a deep core monster. Seismic studies done (link has vanished since last week) in 2003 showed huge pockets of methane gas under volcanic pressure; up to 100,000 psi. Pressures that high are beyond human technology and we have no way to control them. There is evidence to suggest that BP should never have been allowed to poke a hole in it. A 1997 MMS report explains the reasons in detail. After reading the MMS report, it is obvious that BP knew the risks of tapping the Macondo field were huge. But the financial rewards were too tempting; the Macondo reservoir holds the second largest deposit of natural gas and oil on the planet. And there is scientific evidence to suggest (See video below) that it is virtually bottomless, through deep channels to the largest reservoir in the world - near the Yucatan peninsula. To an oil company, Macondo is the black gold dream they would sell their souls for.